A classic within its sector, the Relexa hand shower combines timeless, ergonomic design with a choice of up to five spray patterns. From the entry-level Relexa Trio to the Relexa Five, the range allows you to choose a combination of patterns to match your individual showering needs. 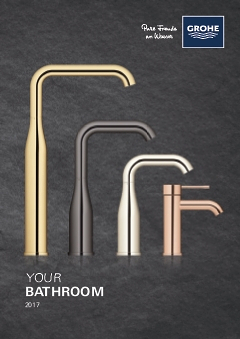 Designed for performance, Relexa features GROHE DreamSpray® technology for perfect water distribution and GROHE StarLight® technology for a pristine finish. Normal Spray: A great all-encompassing spray pattern with a refreshing and relaxing effect. Its universal appeal makes it a great all-rounder. Rain Spray: Wide and luxurious – a soft, delicate pattern to soothe the skin. Mimicking warm summer rain, the spray provides a full and even coverage. Jet Spray: A focussed circular spray, which delivers a refreshing burst of water. Ideal for stimulating the skin or simply cleaning the bathtub or shower. Massage Spray: A pulsating spray pattern for a stimulating massage. Champagne Spray: Enriched with air for bigger, softer water droplets. More air means that less water is required when using this fulfilling and gentle spray pattern.